Me and Sandrine left Isla Mujeres in the early afternoon, we wanted to catch a bus to Valladolid and be there before the sun would go down; we decided to visit this town for a day so we could be close to the Chichen Itza ruins the following morning. We had about 3 hours ride from Cancun to Villadolid, in a quite dirty and uncomfortable bus by a company called Mayab. It was not like ADO, much cleaner and professional. On this bus every now and then a street vendor would board the bus trying to sell food or bags or whatever. Even though most of them were quite annoying, we found a very funny original one, who pretended to sell a special oil to cure so many illnesses in one that me and Sandrine burst out laughing like dumbs. We arrived to Valladolid quite late in the end and while grabbing our luggage we bumped into an italian guy traveling on his own, Federico. “Are you also italian? ” we said. Typical clichés, and we left. 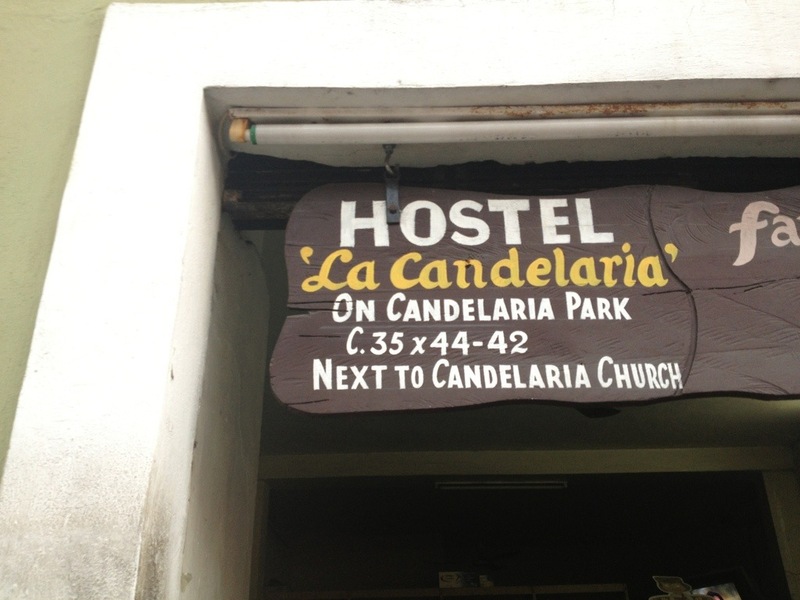 We found this colonial town quite nice at first sight, we started walking towards a hostel that had been recommended, called Candelaria Hostel but we had not booked any space. 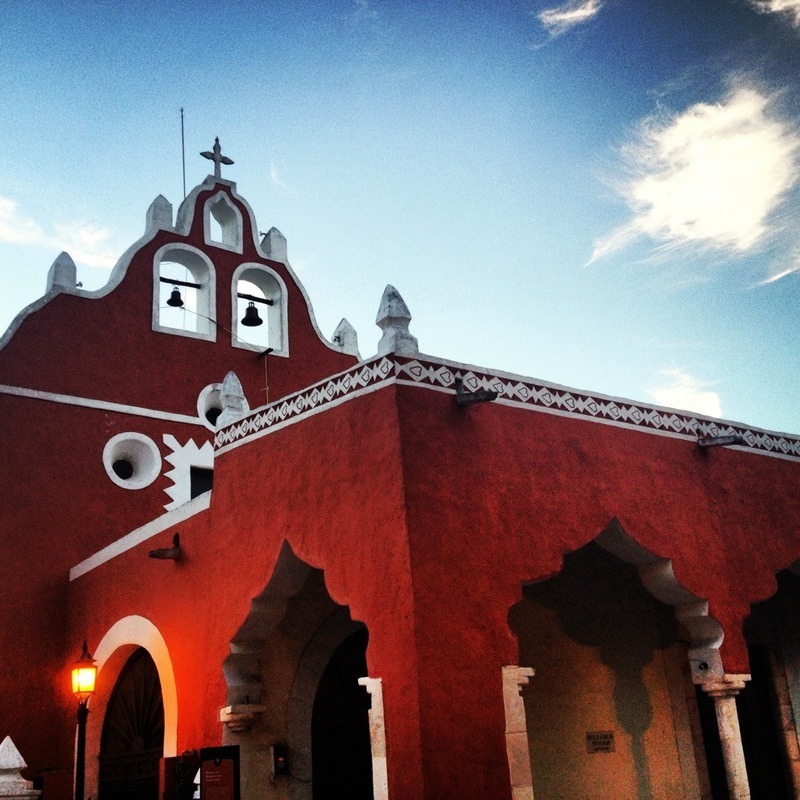 We bumped into a beautiful red church with white edges and a moorish hint from the 17th century, the Candelaria: beautiful. And there was a blue sky that even if was getting darker was a marvelous contrast with the church. On the way to the hostel we met again the italian guy of the bus, who told us that the hostel was unfortunately fully booked. We went anyway to see it, it looked really cool and smart and we had a look to its famous garden in the backyard. As we were told from the receptionist that there was no space, we finally went in a hotel. I had not been in a proper hotel for a while and I have to admit it was really clean and comfortable, I probably needed it, even if we were welcomed from the worst staff ever. 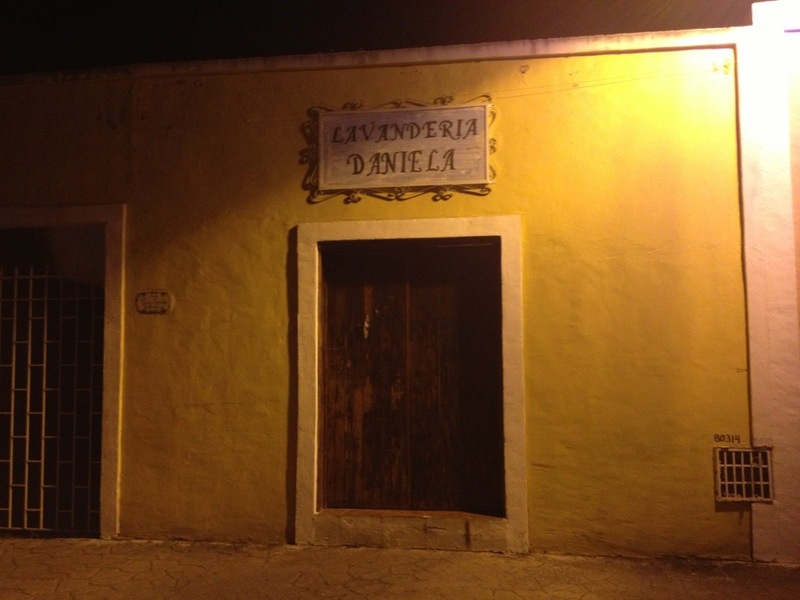 We joined Federico for dinner, he took us to a hidden corner where to enjoy authentic Yucatan food, as he feels kind of local in this area. 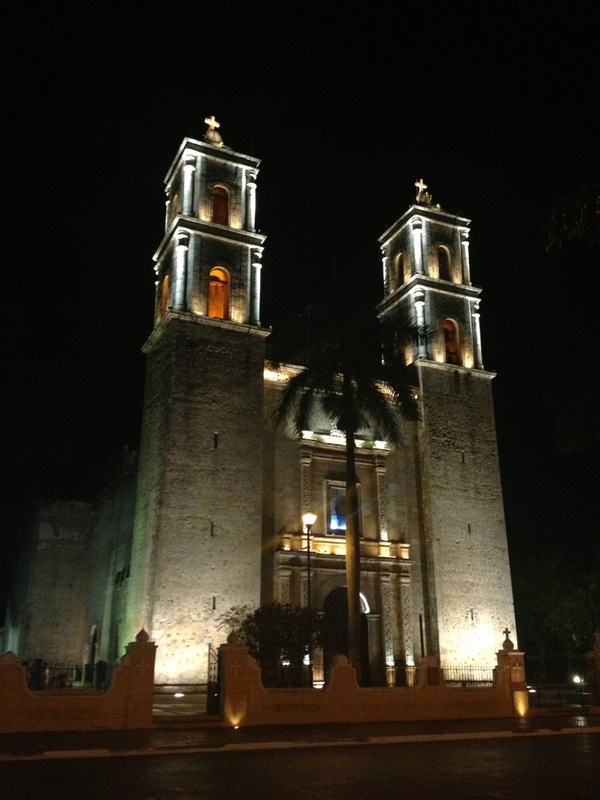 He is a great traveller but is now living in Yucatan peninsula and often comes to Valladolid. Few years ago he attended a master in England where he met a couple who moved to Mexico few years later. He decided to join them for an important project and so he is now living in El Cuyo. A place that is still very far from tourism, close to a biosphere reserve. This place is apparently famous for hosting the majority of the pink flamingo of Mexico as well as being considered one of the most important beaches in the world for the nesting of the hawksbill turtle. We had a lovely meal with Federico, drunk a few beers and enjoyed his really interesting life stories. He was really funny and smart, it felt like we knew him forever and we keep talking to him during our pleasant walk after dinner. We passed through the Zocalo, “main plaza” and crossed a park with the fountain of the “Mestiza”. 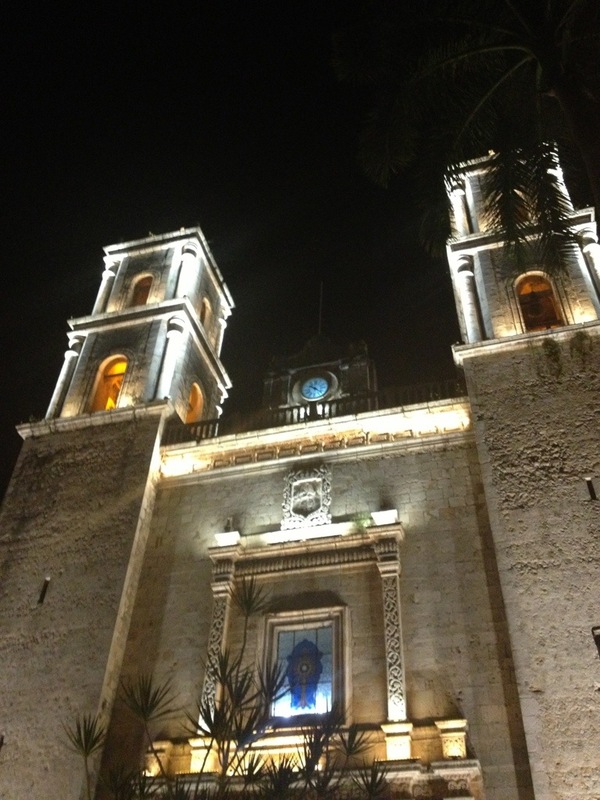 On the southwest side of the Plaza there was the majestic 16th Century Cathedral of “San Servacio”. Beautiful: we took some pictures, commented on the cathedral and read somewhere that it had been scene of a bloody crime and had been demolished and rebuilt in the 19th century. We got tempted from a churros seller on the square and bought a few. Unfortunately they were not really nice and probably cooked with an old oil. Luckily it was the only bad choice of the night, since the rest was really good, there was a nice moon, a lot of tranquility and fresh air. We walked a beautiful colonial street called ” calzada de los frailes” all the way to the Convent of San Bernardino di Siena, built by Franciscan missionaries in the 16th Century. 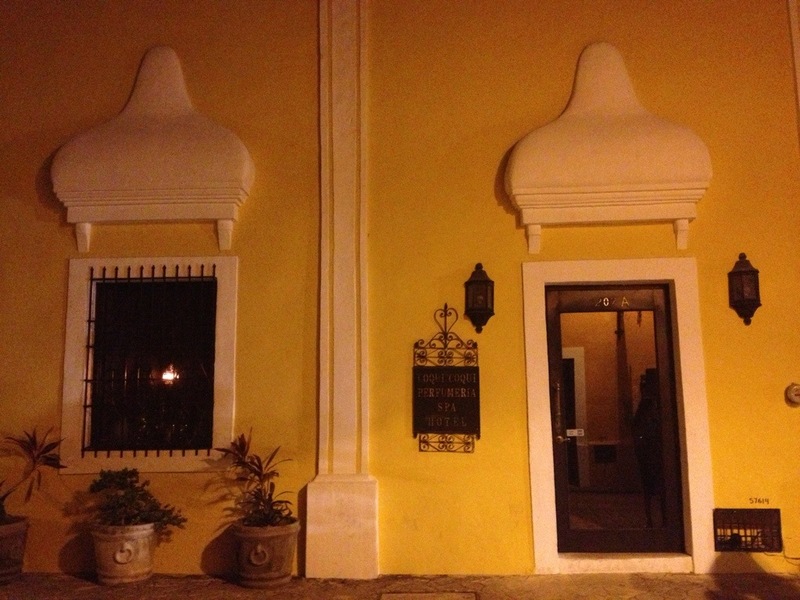 We wandered around enjoying the beautiful colonial architecture of this lovely town and when we finally got to the hotel all we wanted was having a rest and sleep. The best of traveling is just meeting nice people as Federico, bumping into places you had never heard of and being far away from the conventional things you would do at home.